For National Football Authority, we break down the rumors about whether long-time Buccaneers CB Ronde Barber will retire. Does Barber want to return? Do the Bucs want him back? What should the two sides do? Click here to read all about it. Will Buccaneers keep CBs Ronde Barber and Aqib Talib? For National Football Authority, we look at the sea change that could be coming for the Tampa Bay Buccaneers at cornerback. We look at the reasons that the Bucs have to let both Ronde Barber and Aqib Talib go, and try to predict what will happen in each situation. Click here to read all about it. For National Football Authority, we check in on the Tampa Bay Buccaneers and cornerbacks Aqib Talib and Ronde Barber. We discuss Talib’s showdown against Detroit WR Calvin Johnson in Week One and Barber’s newfound status as the NFL’s ironman. Click here to read all about it. Apparently, this is criticism week here on Football Relativity. After pounding Ryan Mallett yesterday, we have a new target – ex-Giants running back Tiki Barber, who announced Tuesday he was going to try to come out of retirement and return to the field at age 36. I’ll explain the Hall of Fame comment below. But first, let’s think about why Tiki is trying a comeback, and whether he realistically has a shot. And suffice it to say, I’m skeptical on both counts. Most running backs hit the wall at age 30, so it’s foolhardy to think that Barber at age 36 will be anywhere close to his prime years. While he hasn’t taken a pounding on the field in four years, there’s no way he still has the quickness or the durability he did when he was four years younger. And yes, Tiki’s twin brother Ronde is still playing and playing well, which speaks well to Tiki’s genetics. But coming back from being away is far different than keeping the body in shape for one more run, and playing cornerback is a lot less physical than playing running back. We’ve seen several cornerbacks – Darrell Green, Deion Sanders, etc. – play into their late 30s, but finding a late-30s running back is like spotting a unicorn. If Tiki’s return is such a longshot, why is he doing it? Tiki left the game early in large part because he was ready to start a TV career. He had a great opportunity with NBC not only to be on Football Night in America every Sunday night but also to be a contributor to the Today Show. In many ways, Tiki was being groomed for the morning-show landscape. But he proved to be bland on camera, and then personal issues turned his blandness into outright dislike. Now it appears network TV isn’t an option. That truth makes this announcement – perfectly timed, as I tweeted – at the very least an attention grab. It may also be a money grab, based on his costly divorce. But either way, it’s impossible not to be skeptical of Tiki’s motives. Tiki developed a reputation as a clubhouse lawyer, and this seems to be a natural move for a guy who’s all about himself. For those reasons, if I were a team I’d consider Tiki as not worth the hassle. The Giants have already decided as much, saying they’re going to cut him free as soon as it’s allowed. That isa big-time sign about Tiki’s reptuation and his chances. Now that the playing question is settled, let’s address the Hall of Fame question. Actually, it’s not much of a question. Barber falls significantly short of that level. While he played 10 years, his peak was closer to five years. And while he was a threat both running and receiving, he wasn’t the player recent electee Marshall Faulk was. I’d say Barber was 70-80 percent of the player Faulk was. Curtis Martin and Jerome Bettis, both running backs from Barber’s era, were left unelected this year, and I’d take both before electing Barber. Instead, Barber belongs in the Corridor of the Capable. (That’s my term for Matt Smith’s idea of a Hall of the Very Good. It’s a place where the busts are made not of granite but of Formica and where, instead of getting a yellow blazer upon induction, you get a nice argyle tie. The induction dinner isn’t steak and lobster, just a perfectly acceptable chicken breast with some steamed vegetables.) So don’t hold your breath for Canton, Tiki. Instead, enjoy your Formica. In what should be a slow time for re-signings, two star cornerbacks inked returns to their teams yesterday. 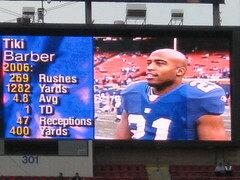 Ronde Barber will return for his 15th season in Tampa Bay, and Champ Bailey signed a four-year deal to remain with the Broncos. Below are some thoughts on both moves and the legacies both players are leaving. In Denver, Bailey is still an elite cover corner, and the Broncos prioritized his return. Now the two sides have a four-year deal potentially worth $43 million that will keep Bailey around. Bailey may not quite be at the level of the current top cover men like Nnamdi Asomugha and Darrelle Revis, but he’s still in the shutdown corner category. That’s impressive considering he’s got 12 years behind him in his NFL career. For the Broncos, Bailey’s return means there’s one less question to answer as they try to rebuild a defense that was horrific last year. And while Bailey isn’t a long-term answer at age 33, the 10-time Pro Bowler can provide performance and stability over the short term while the Broncos find solutions elsewhere. The future Hall of Famer – and we don’t throw that term around lightly – has a chance to add to his impressive resume. In Tampa Bay, Barber isn’t the big star that Bailey (or even his twin brother Tiki) has been, but in his 15-year career he has been perhaps the best cover-2 cornerback in the league. He’s now the lone holdover from the historic Bucs defenses of the early part of the decade (now that Warren Sapp, John Lynch, and Derrick Brooks have moved into broadcast booths and studios), but he still plays well enough to be a solid starter on a young team. The Bucs have developed Aqib Talib into a top-quality corner, so Barber doesn’t have to carry the load, and his skills actually will work well in the slot if the Bucs want to use a younger, faster player outside going forward and feature Barber as a blitzer as well as a cover man. Barber isn’t the sure-fire Hall of Famer that Bailey is, but he will be in the Canton conversation, and his Tampa Bay-only career will make him a legend for the Bucs for a long time to come.